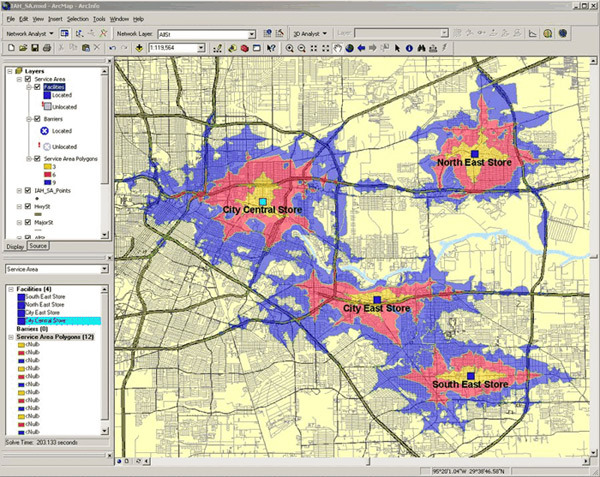 Trade area maps describe the characteristics of the area around a store or network of stores. Without accurate trade area definitions, you cannot measure the key statistics that impact a store's performance. Trade area maps from Mapping Analytics help you discover where customers come from, understand areas around store or office locations, and predict trade areas for new locations. The trade area map above uses drive time to predict trade area boundaries around stores. Many other types of analysis can be used for trade area definition.